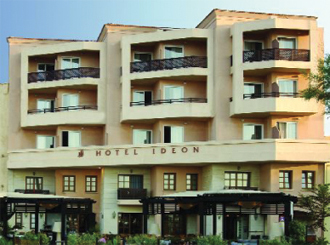 Hotel Ideon is located in an ideal setting washed by the Cretan Sea and surrounded by the old Turkish Venetian town, with its magnificent monuments, majestic Fortress and its Venetian Port. All these within easy reach of the commercial and cosmopolitan center of the town, including its excellent, long sandy beach. 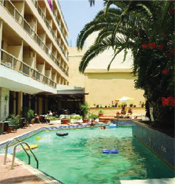 The hotel is 85 kilometers from Heraklion airport and 60 kilometers from Chania airport. 83 double and single rooms in the main building comfortably equipped with bath, balcony, a/c, heating, fridge, safe deposit box, sat. TV, radio, direct dial telephone, wireless Internet. 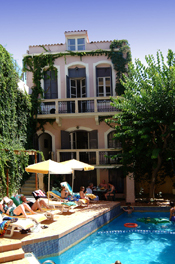 6 suites are located in a renovated Venetian house next to the pool. 9 suites totally renovated and newly built in the characteristic style of the old town of Rethymno. Except of the standard equipment, these suites provide also kitchenette. Hotel Ideon provides to its guests a friendly reception service, restaurant with a rich buffet for breakfast and dinner with a rich variety of Greek and international specialties. The cozy cocktail bar in a spacious lounge with quiet corners completes the right atmosphere to relax and have a drink. Guests can also rent cars, motorbikes and book excursions to all parts of the island and Santorini. The outdoor pool surrounded by a nice garden and next to the snackbar offering small snacks and cool drinks makes this charming inside court the most comfortable.